torn ligament, or severe inflammation leading to bone spurs. All of these issues can be treated with non-surgical options initially, but if they are left untreated it can lead to severe complications and the need for surgical options. If you have a damaged rotator cuff your doctor might recommend surgery in which case you will have to meet with an orthopedic surgeon to discuss your qualifications for surgery. 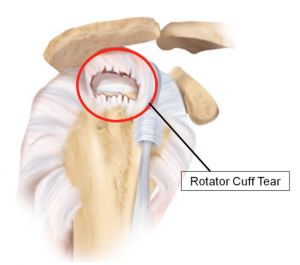 What causes the rotator cuff injury? 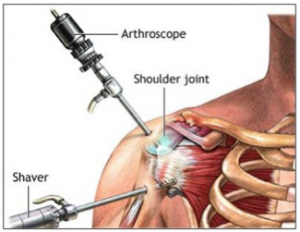 The shoulder consists of a ball and socket joint. Inside of this joint there are three bones. Around all three bones there is a strong connective tissue which helps the bonds to stay inside of your socket. The tissue covers the shoulder joint and attaches all of your bones to your shoulder blades. Your shoulder needs your tendons to be strong in order to remain stable. The area is referred to as the rotator cuff and has four muscles which form the cuff that sits at the top of your arm bone. If this region sustains regular stress it will deplete the overall strength and the durability of these muscles. This can lead to severe injuries. If the muscle or tendon located inside of your rotator cuff becomes overworked it can cause inflammation. In the sports where you must throw overhand the regular stress can cause inflammation which eventually leads to radiating pain along the side of the arm in the shoulder. For some people this pain is mild and for others it is excruciating. should take no more than three months to be back to normal after you have undergone the arthroscopic surgery to repair this area of your body. Lying flat might pull on the shoulder and cause increased pain while your shoulder is healing. Impatience of indicated that sleeping upright in a chair is the best way to sleep following surgery. As with any surgical process there are potential complications associated with this procedure. It is important to remember that all surgeries bring with them potential complications but the risks associated with this procedure are very few. One of the most common risks is infection. For this reason you will be prescribed antibiotics after your surgery. Another risk is blood clots and excessive bleeding which can also be treated. Rehabilitation is an important step in order to get back on track with regular activities. Your surgeon will help you to create a physical therapy exercise plan which will retrain your motion and your strength. Your surgeon will make a personalized plan contingent upon your particular procedure. The more complicated the procedure the more likely it is that you will have to work with a licensed physical therapist for your recovery process. Dr. Farber at Phoenix Shoulder and Knee is a top notch orthopedic surgeon who is Board Certified and Fellowship Trained in sports medicine. He offers minimally invasive arthroscopic surgery to repair rotator cuff injuries. Most insurance is accepted, simply call (480) 219-3342 today!